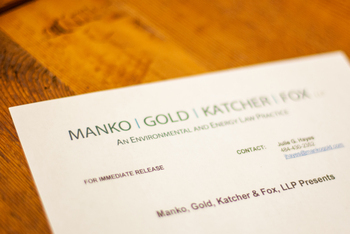 MGKF partners Joseph M. Manko, Bart E. Cassidy, Jonathan E. Rinde and Carol F. McCabe, will participate in the 2016 Environmental Law Forum. This annual two-day event draws attorneys, engineers, consultants, professors and scientists to Harrisburg for an update on Pennsylvania environmental law. The firm is a Silver Sponsor of the Forum and McCabe serves as one of the course planners for the event.